While the 24-year-old couldn’t find the motivation, Roger Federer and Novak Djokovic didn’t find their resolve tested in the first round. 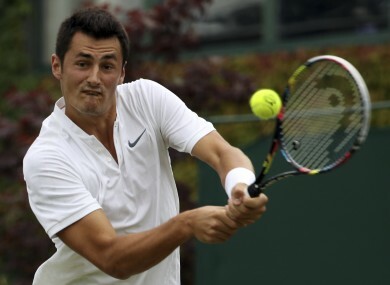 BERNARD TOMIC ADMITTED today that he has lost all motivation for tennis and couldn’t care less if he won or lost as every single Australian crashed out of Wimbledon men’s first round. The talented Tomic was once mooted as a rising star of the sport but says he has hit a mental block, facing another decade drifting around the tour earning money but with little chance of breaking the big four’s stranglehold on the major prizes. “Holding a trophy or doing well, it doesn’t satisfy me anymore. It’s not there,” the 24-year-old said after being dumped out by Germany’s Mischa Zverev, as all seven Australian men flopped at the first hurdle. “I wasn’t mentally and physically there with my mental state to perform. I felt a little bit bored out there. “I couldn’t care less if I make a fourth-round US Open or I lose first round. To me, everything is the same. I’m going to play another 10 years, and I know after my career I won’t have to work again. “You have to respect the sport. But I think I don’t respect it enough. Tomic reached the Wimbledon quarter-finals in 2011 and is the Australian number two behind Nick Kyrgios — another troubled character – but his world ranking has slumped from a career high of 17 last year down to 59. “I just can’t seem to find the commitment to work hard, to enjoy, and to lift trophies,” he admitted. Tomic accepted he could shake up his support team in a bid to get his career going again but said: “I don’t think I really want it”. Tomic’s 6-4, 6-3, 6-4 defeat to 27th seed Zverev was all over in an hour and 24 minutes. “I don’t know what was wrong with him but I could definitely tell he was not 100 percent,” said Zverev. It added to a played seven, lost seven wipeout of Australia’s men at Wimbledon. Thanasi Kokkinakis was beaten in four sets by 29th seed and former US Open winner Juan Martin del Potro, while Jordan Thompson lost in straight sets to Spanish 25th seed Albert Ramos-Vinolas. On opening day, Kyrgios retired hurt, struggling with a left hip injury, while John Millman lost to Rafael Nadal and qualifier Andrew Whittington went out to Thiago Monteiro. In the ladies’ draw, Arina Rodionova saved Australia’s blushes — and seven match points — as she became the only Aussie through to the second round. The qualifier, and world number 166, dumped out Russian 16th seed Anastasia Pavlyuchenkova 6-3, 6-7 (6/8), 9-7 in a rollercoaster encounter, taking it on her own fifth match point. The Australian number four’s reward for her first Grand Slam singles win is a second round clash with Kazakhstani wildcard Zarina Diyas. Rodionova’s two compatriots in the women’s draw were knocked out: Daria Gavrilova, the 20th seed, lost 6-4, 2-6, 8-10 to Croatian qualifier Petra Martic, while on Monday, Ashleigh Barty lost to Ukrainian fourth seed Elena Svitolina. 2011 US Open winner Sam Stosur is out injured. Historically one of the dominant forces at Wimbledon, Australia’s last men’s champion was Lleyton Hewitt in 2002, while their last women’s title winner was Evonne Goolagong Cawley in 1980. Meanwhile, much higher up the seedings, Roger Federer and Novak Djokovic barely had to break sweat to make winning starts as their injury-hit opponents retired hurt from their first round matches. Federer is chasing a record eighth Wimbledon title and he was already well on top at the start of his 19th All England Club campaign when Alexandr Dolgopolov was forced to quit with an ankle injury. The world number three raced into a 6-3, 3-0 in 43 minutes on Centre Court before the Ukrainian limped off. Federer, who hit his 10,000th career ace in the eighth game of the first set, will face either Dusan Lajovic of Serbia or Greek qualifier Stefanos Tsitsipas for a place in the last 32. “It feels great to be back on Centre Court,” said Federer, who recorded his 85th match win at Wimbledon, passing the mark he shared with Jimmy Connors. Having unexpectedly won the Australian Open in January before taking the clay-court season off to rest, Federer, making a record-equalling 70th Grand Slam appearance, is the favourite to take the Wimbledon crown for the first time since 2012. Djokovic, a three-time Wimbledon champion, was leading 6-3, 2-0 when Slovakian world number 47 Martin Klizan retired after just 40 minutes on Centre Court due to a calf problem. The 30-year-old Serb will face Adam Pavlasek of the Czech Republic for a place in the last 32. It was the kind of trouble-free first round Djokovic would have been hoping for after the most turbulent period of his career, the 12-time major winner losing in the Australian Open second round and the French Open quarter-finals. “He had issues walking on to court. I tried to focus on my game plan, I was serving well and when it mattered I made a break,” said Djokovic, who is aiming to win a first Grand Slam title since last year’s French Open. Email “'Bored' Tomic admits he's lost his love for tennis as all 7 Aussie men fall at Wimbledon's first hurdle”. Feedback on “'Bored' Tomic admits he's lost his love for tennis as all 7 Aussie men fall at Wimbledon's first hurdle”.